Statutory requirements – Statutory information includes a range of certifications and may include background checks, etc. Requirements for information vary by state. When writing your resume, ensure that you have included all necessary references. Qualifications and prior work history – Levels of qualification are defined at the academic level of training for student teachers. Experience requirements will vary according to the needs of the position and the related tasks. Your career aspirations, “why you want the job”, which explains how your job application fits your career path. It plays the especially crucial role in such resumes as the music teacher resume, because you future career can be connected with some live concerts and travelling. It is better to keep such information not to look unreliable employee. Name/ and contacts – Use your full preferred name, and a trustworthy point of contact for your phone and email. Personal statement/ personal profile/ objectives – This section is used to introduce yourself to your readers and summarize your work, career objectives and experience. Skills – Pay close attention to this section, because it’s critically important. Your skills are your competitive assets when applying for a job. Make sure that your skills list includes a good range of matches for essential skills. Formal qualifications – You need to define your level of academic achievement clearly in relation to job qualification requirements. Qualifications, particularly foreign qualifications or partial qualifications, can be tricky in the US. Make sure your qualifications are officially recognized. Employment history – Your employment history should show appropriate levels of experience to meet the needs of the position. 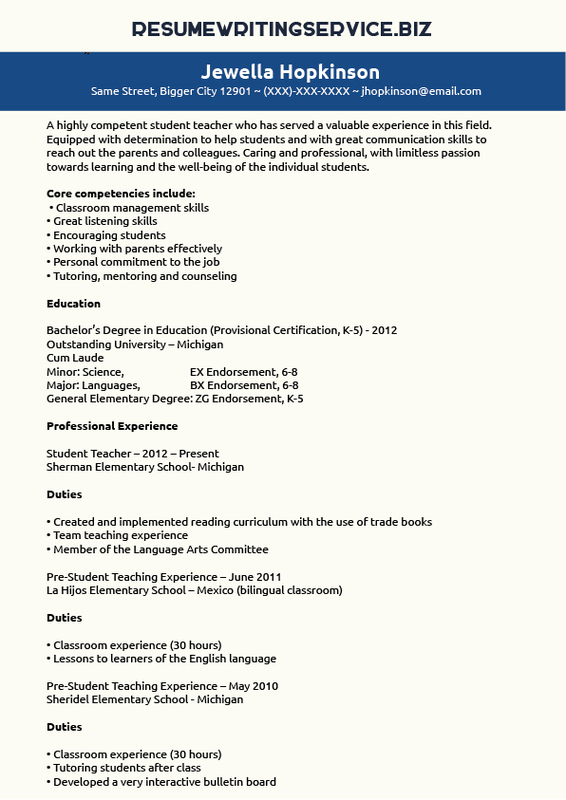 Never use a pre-written teaching assistant resume when applying for a job. Always target your resume to every job application. The good news is that this is easy to do. Functional resumes are easy to edit and allow you to manage your information quality very effectively. Skills – Your best skills are your strongest claims to the job. Focus on showing your skills using productive indicators and quantifiable outcomes. For example, you can show your experience in managing specific job-related tasks, or organizational skills in dealing with high volume work. Experience – Your experience must be clearly relevant to the job. This is critically important – The employer must see that you can do the work required. Show the right experience, matching your work history to the needs of the role, highlighting experience in essential areas. If you need help with a student teaching resume, feel free to contact us anytime!